JK's Galleria of Vintage, Classic and Pristine Cars is honored to present a most breathtaking example of pure vehicle design decadence...this is the vehicle of dreams! 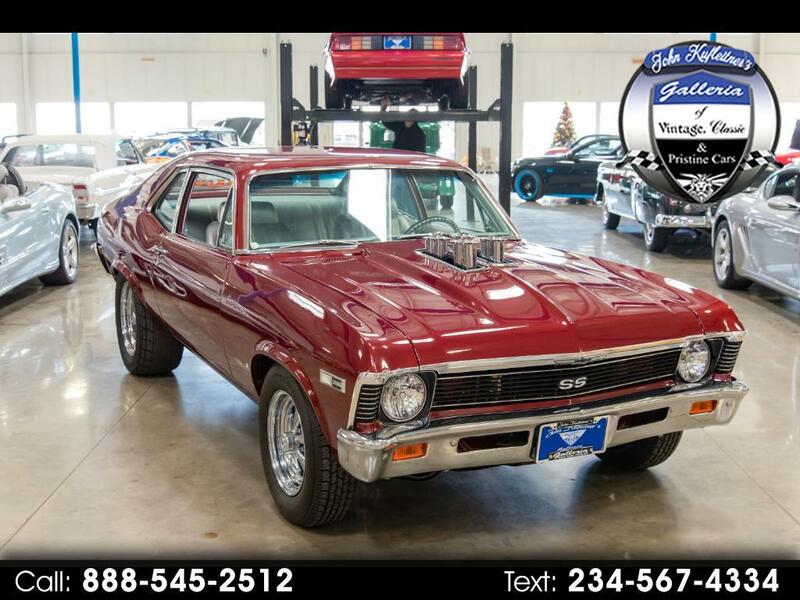 This Amazing 1968 Nova SS Restomod is a recent, no expense spared, Professional Nut & Bolt Rotisserie Restoration with Less than 200 miles on it since completion. She is Powered by a Brand New GM Performance 572 Big Block with Hilborn Injection (around 750 hp) bolted to automatic transmission and it puts the power to the ground through a Positrac rear end. This car was built for street but is fully ready for track use. It runs on High octane pump gas but it likes 107 octane when available. Power Steering and Power Brakes make this car simple to drive around town. The interior is all new including gauges, seats, carpet, headliner and Even a brand New Vintage Air system (Cold Air/Heat/Defrost). The body is laser straight with an absolute stunning no expense spared paint job. This car is street legal and everything is working as it should including headlights, dash lights, interior lights and blinkers. I do not have receipts from the build but from our inspection and the components we are sure there is well over 120K in this build. This car fires right up, idles smooth, pulls strong, shifts smooth, drives straight down the road and stops on a dime. This car has Dual AGM batteries so it is always ready to go. This car was traded in at our Dealership for a Brand new Hellcat last year so we have had a chance to inspect, fine tune and drive this car. There are no leaks, no smoke, and no issues with this one. Overall this car is simply amazing. It is a complete car and is ready to go. Also remember we can facilitate shipping right to your door. We also take anything of value on trade and can obtain financing with almost new car rates and terms up to 120 months!! What that means is the car of your dreams can very easily turn into a reality!